In late August 2018, I drove a rental compact SUV from Inuvik NT to Tuktoyaktuk (commonly shortened to "Tuk", avoiding the hassle of correctly pronouncing "Tuktoyaktuk") on the Arctic coast, via the ~140 km Inuvik-Tuktoyaktuk Highway (NT 10). The highway was opened in November 2017, replacing the old ice road on the Mackenzie River from Inuvik to Tuk, which is now permanently closed. But last spring's thaw was unkind to the new road, and it was undergoing major repairs with frequent road closures in May-June 2018 (foiling my original plans, and corco's, to travel the highway in June while both Inuvik and Tuk had 24-hour daylight). The southern half of the highway was still being worked on in August, but was drivable without much difficulty with only brief delays from construction zone slowdowns. I drove out to Yellowknife NT from northern Virginia, then left my car at the Yellowknife airport to fly up to Inuvik. Part of that was to avoid re-traveling the Dempster Highway (YT 5/NT 8), which I drove up to Inuvik in 2012 in my former pickup truck. 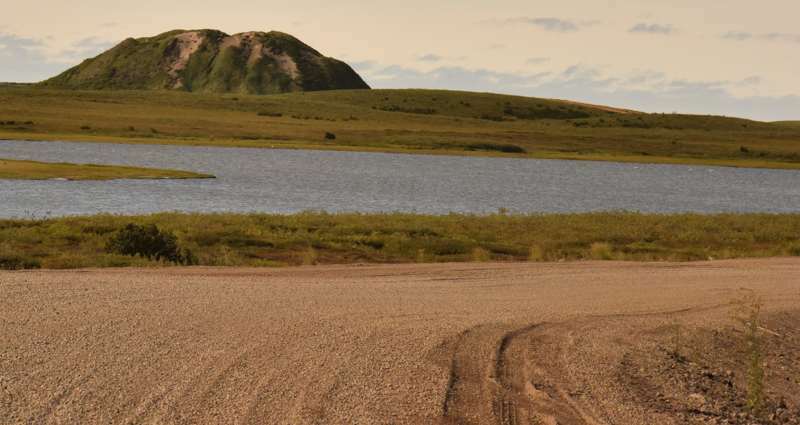 That would've added a lot of mileage to my trip, in a vehicle that could comfortably handle unpaved highways like the Inuvik-Tuk road, but I wasn't confident it could handle the more difficult stretches of the Dempster. Also, flying to Inuvik let me work in a two-night stopover in no-road-access (except in the winter) Norman Wells NT on my way back to Yellowknife. One appealing thing about air travel in the Canadian Arctic is there is no security screening on flights north of Yellowknife, even on the 737s I took to and from Inuvik. The highway to Tuk passes through a completely unpopulated region, winding between many small lakes which precluded a straight-line route. Inuvik, Tuk, and the region in-between are in permafrost country. So the road was built mostly in the winter when the ground was solid enough for heavy construction vehicles, and rests on a deep gravel roadbed with insulation to help keep the permafrost from sagging under the road. There are no travel services, or any other sign of civilization besides the road and its signs, in the 148 km between Inuvik and Tuk. There are also no trees, except south of the "tree line" at km 3. The highway's maximum speed limit is 70 km/h, and in some places the limit is lower (especially on the local roads in Tuk), so plan on at least three hours one-way. Tuk officials estimated in July 2018 that about 30-50 vehicles on average were traveling to their hamlet every day, though that count might have been depressed by difficult road conditions and associated construction earlier that summer. NT 10, and Tuk's local roads, are completely unpaved. So is most of the Inuvik road network, except the northernmost few km of NT 8 (torn up for reconstruction during my 2018 visit, but there for my 2012 visit), a few paved blocks downtown, and also the Inuvik airport's runway is paved for 737 jet service. Subsurface permafrost is unfriendly even to gravel roads, let alone pavement, which is why there's so little pavement north of the Arctic Circle. ^ Here the Dempster Highway (NT 8) ends, at its intersection with Navy Road. 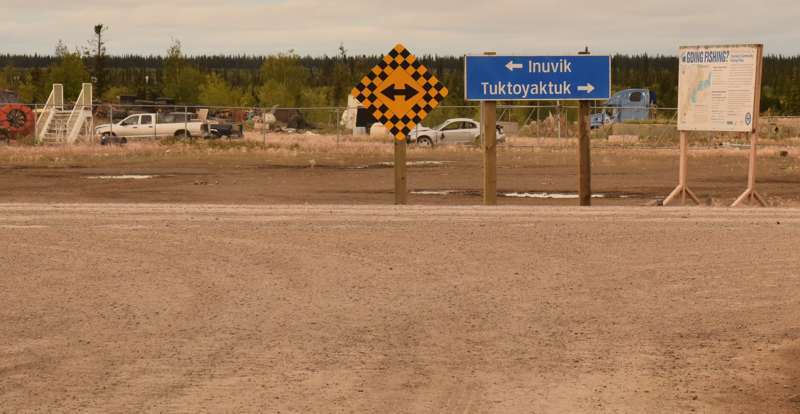 The only change since my 2012 visit to Inuvik is the sign directing travelers to new destination Tuk. There is no End NT 8 sign at this intersection. Nor are there any NT 8 route markers north of the Inuvik airport, and when I traveled the entire Dempster Highway in 2012 there was only one NT 8 marker (on the southbound Dempster near Tsiigethchic) between the airport and the Yukon border. I also didn't see any NT 10 route markers anywhere along that route (maybe later, after construction crews finish working on the highway). As is customary in the Arctic, hardly anybody uses route numbers, and transportation agencies are pretty casual about putting up route markers. except where they are really needed at major highway junctions. 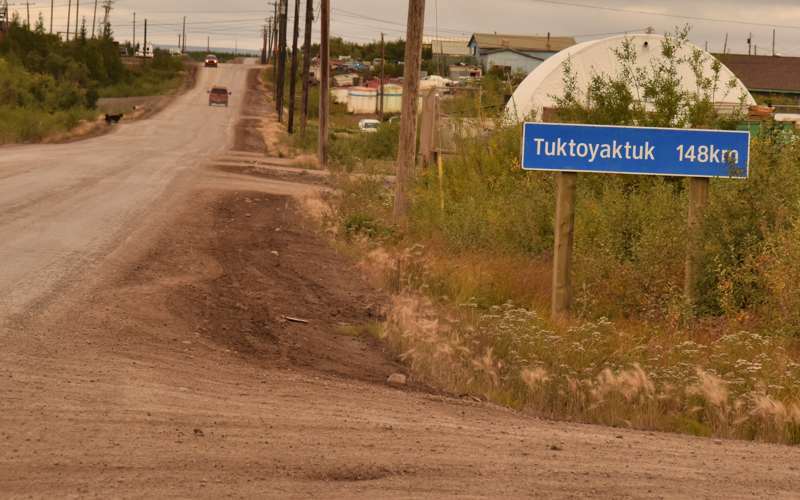 ^ Also at this intersection is a sign noting that it's 148 km to Tuktoyaktuk. NT 10 starts about 5 km north of here. Until then, this road is just an upgraded version of Navy Road. 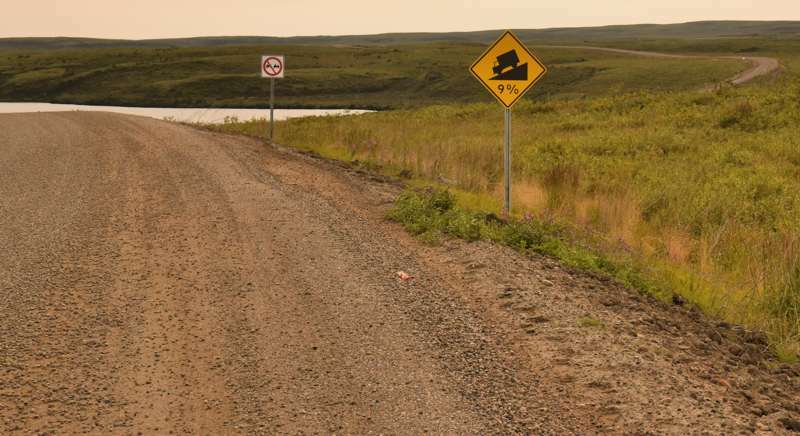 ^ This sign confirms that the Inuvik Tuktoyaktuk Highway (which starts about 1 km north of here) is open, and doesn't have a weight limit less than the legal axle weight (overweight permits are never allowed). ^ Km-post 0 at the right marks the beginning of NT 10. This about where the new highway peels away from the old Navy Road alignment (a short unsigned Navy Road remnant still exists north of the highway). The highway has similar km-posts every 5 km, up to the highest one at km 135 a few km south of Tuk. ^ This part of NT 10, somewhere between km 30 and km 57, is typical for most of the highway, including the 70 km/h speed limit. There are no higher speed limits, but in some places (especially in construction zones, or at narrow bridges) the limit drops to 50 km/h or 60 km/h, and once you reach Tuk its local road limits will be even lower. ^ The first of several narrow bridges on the highway, posted at 50 km/h. at km 8.5. ^ This no-facilities pullout near km 30 is what for now passes for a "rest area" along the highway. ^^ This bridge, at km 57.0, over Hans Creek is the longest one on the highway. ^ You're more than halfway to Tuk! The next few km include some places to pull over and take in the scenery, and possible sites for future day-use parks. ^ I think this is the only grade warning sign on the highway, at km 124.3. ^^ The welcome sign for Tuk, "land of the pingos" (see next item for more on pingos). This marks the end of NT 10, at Tuk's southern municipal boundary several km south of the hamlet centre, per the legal definition of the highway. It is at km 139.2, north of the highway's last km-marker at km 135. There is no km 140 or higher km-marker north of the welcome sign. 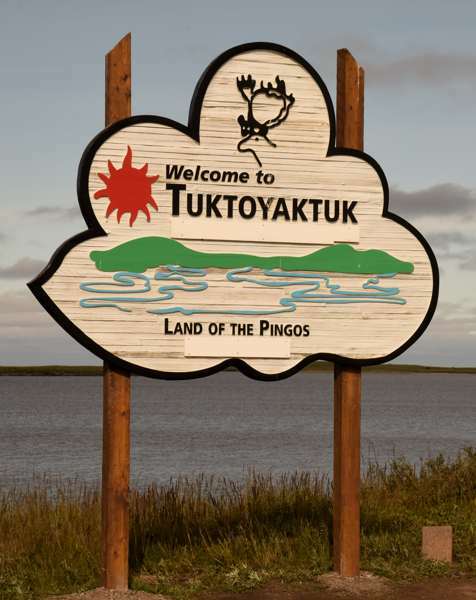 ^ North of Tuk's southern boundary, and west of the road continuing into Tuk, is the Pingo Canadian Landmark. A "pingo" is a landform roughly similar to a giant frost heave, which exists only in permafrost country. The Tuk region has lots of pingos (perhaps the world's heaviest concentration of them), including eight within Landmark boundaries. The one shown here is one of the most prominent, I think the Ibyuk Pingo (world's second largest pingo). ^ The new road ends at this intersection with Beaufort Drive in Tuk. To the left is the airport, the hamlet centre, and the tourist centre at the Arctic Ocean. The road to the right takes you to a military radar facilty (once part of the "DEW Line") for early warning of incoming attacks across the Arctic Ocean. ^ Near the north end of Beaufort Dr. is this monument, marking the end of the northernmost branch of the Trans-Canada Trail. ^ Beaufort Dr. ends here, at a spit extending into the Arctic Ocean. 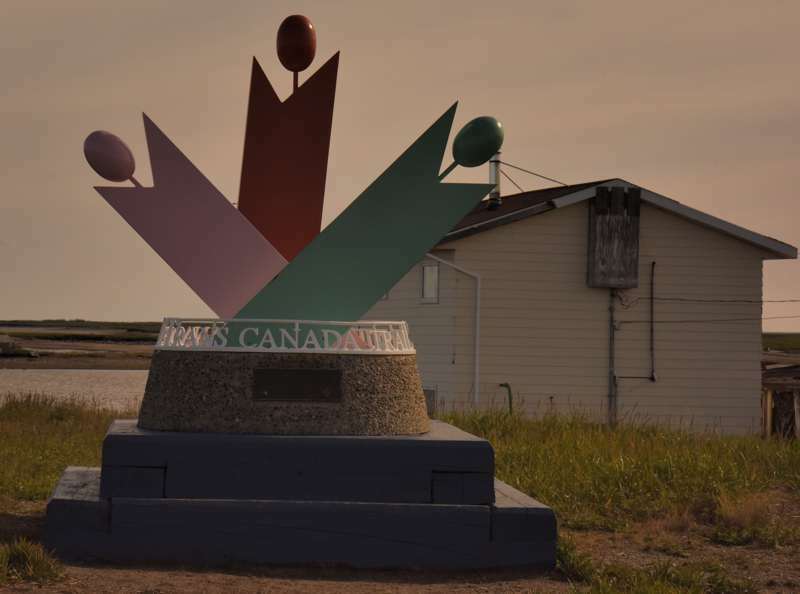 With the new highway connecting Inuvik and Tuk, this now is the northernmost point on Canada's continuous road system. The highway was billed as a chance for Canadians to drive to and dip their toes in the Arctic Ocean, and there were other tourists on the spit with me. However, with subfreezing wind chills that late August day, I didn't go into the water, and I don't think anyone else on the spit did either. On two earlier trips to Prudhoe Bay AK, I waded into the Arctic Ocean when the weather was better and the water temps were tolerable, so I didn't feel like I needed a third dip in the Arctic. Tuk souvenirs were much easier to find in downtown Inuvik than in Tuk. So it was good I bought in Inuvik, before my trek to Tuk, the postcards I mailed to family and friends from Tuk's post office. ^ ^ Also in Inuvik, the Inuvialut Regional Corp. craft shop sells T-shirts and caps for the fictional "University of Tuktoyaktuk", so they could say "Tuk U". I bought the black baseball cap. Officially, then, NT 8 and 10 don't intersect? Right, about a 5km gap between the routes. I don't know why it was done that way, other than that the town of Inuvik might've wanted to retain control over the connecting Navy Road. How do you find such a long distance barren drive? I’m not sure that’s something that I’d enjoy. It’s pretty desolate country up ther. The drive from Inuvik to Tuk wasn't at all barren, or long (only three hours each way). Lots of lakes and other scenery, and the road twists and turns between the lakes. The drive north to Yellowknife from Montana was barren and boring in places, especially AB 35/NT 1 between High Level AB and Enterprise NT. AB 35 is high on my list of most boring roads, along with much of MB 6, and I-5 through California's Central Valley. Once I'm 500 miles from anywhere, I just enjoy what's around me and relax, because there's nothing else I can do. For me, the uniqueness would be the main appeal. I also didn't see any NT 10 route markers anywhere along that route (maybe later, after construction crews finish working on the highway).